These horses are true eye-candy. Make all kinds of lovely horse scenes. A package of Graceful Horse Tubes–a member favorite and definitely one of my favorites as well. But that’s no surprise. Horses have always been a favorite art subject throughout history, dating back to mankind’s earliest days. Perhaps their popularity stems not only from their historical significance but also from their very unique and close bond to mankind. Something about horses inevitably draws us to them, begs us to stroke their muzzle and look into their eyes. They say that if you look into the eyes of a horse that you can see down into the majesty of its soul. I believe that’s true. This package has captured some of the majesty and mystery of horses. 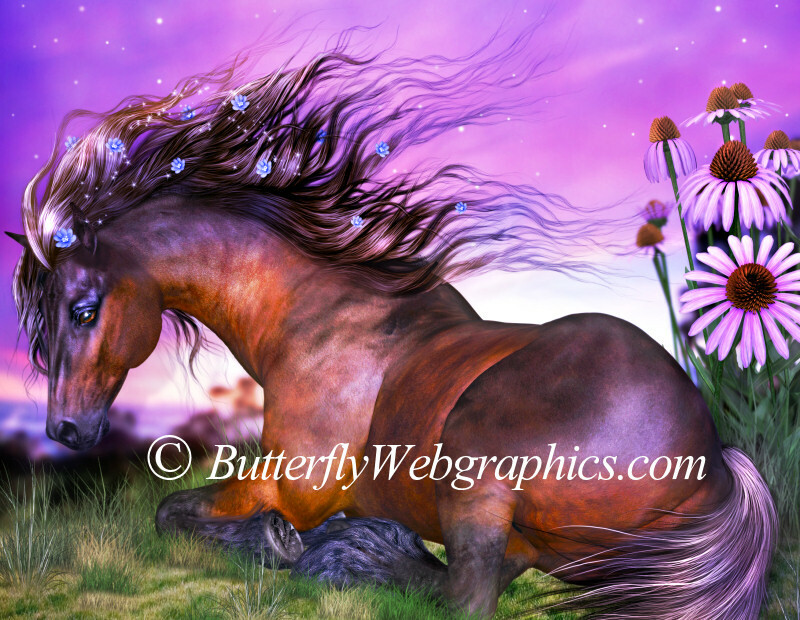 With these graphics, you can create stunning horse scenes of all types, including country, cowboy, Native American, fantasy, and more. 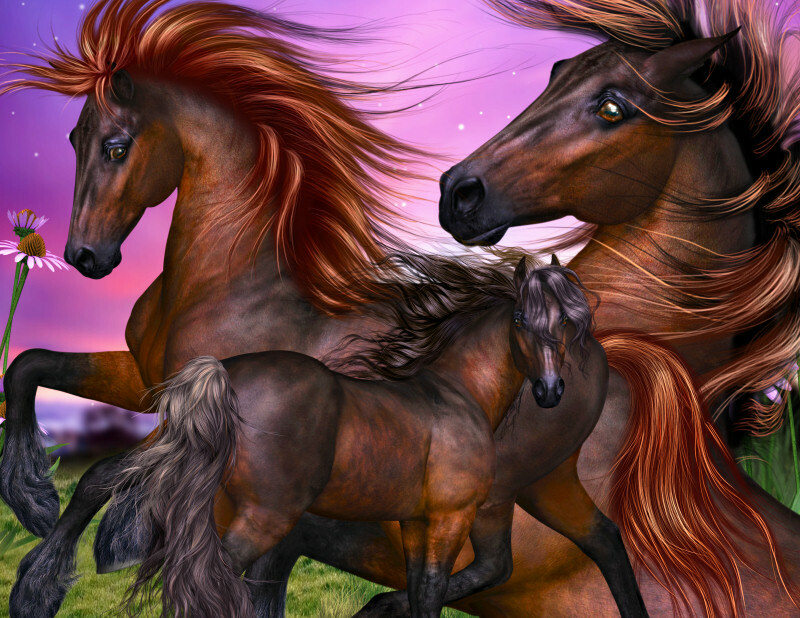 Each of these incredible equines has a flowing mane and tail that was meticulously digitally painted. 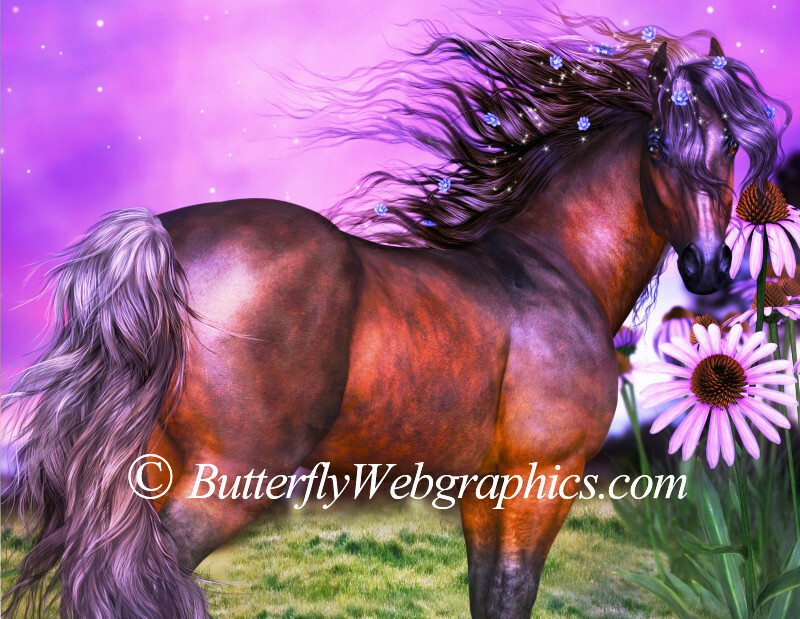 Simply drop a horse onto a background of your choice for an eye-catching design. A background with complementary shades works very well with these horses. Many people have told me that these horse images resemble oil paintings. I’ve included two versions of each horse, a chestnut color and a dark gray/black shade. I’ve also included an extra version of the two horses in the first two promo images, which have flowers and sparkles in their manes as shown. The background I used in this image isn’t included. These horses are extra large. The size of the graphics are approximately 3000 X 2000 pixels. All are 300 DPI, making them great for print projects. Members can use the horses for numerous personal and commercial projects. Review my terms to learn more. This package is two zip files which are approximately 54-61 MB each.